It is Father’s Day this week and even though we never celebrated it when he was alive, I have been thinking these past few days about who this man was who had such a huge impact on our lives and about the things that he taught us so effortlessly. Maybe it is a fond daughter’s idolization of her father but growing up, just watching acchan weave his way through life taught me life lessons no amount of schooling gave me. We grew up in a little house by the tracks that his railwayman’s job entitled him to and on Sundays the house would be full of people- poor, illiterate, exploited rail workers who came to him with their woes, seeking his help and guidance. It was not easy on amma who plied them with endless cups of tea and breakfast; sometimes the meetings would extend much beyond lunchtime and she would stretch her resources and get them lunch too, without the slightest protest. 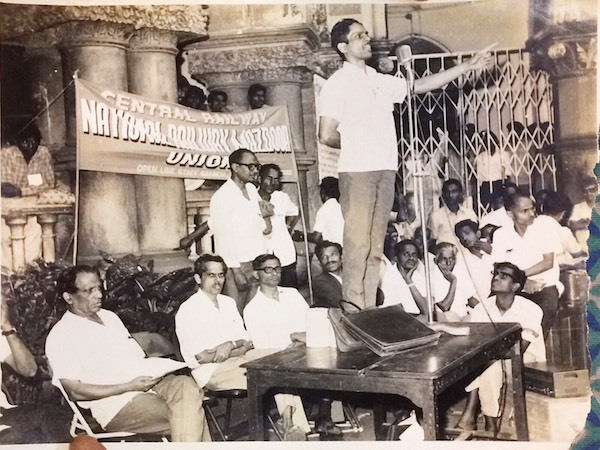 C.Radhakrishnan (on the table) was a man of the masses and had their pulse. We did not have much those days- we never had much through his entire life – because he believed that we were more fortunate than the people who came to him for help and the onus was on us to share our blessings. Right there was our first lesson: Being grateful for our lot in life and sharing our resources, no matter how scarce they were. For his children, compassion and kindness were not just words in the textbook. We learnt those virtues by simply observing the faultless courtesy and kindness with which he treated anyone he ever interacted with. Lying in his hospital bed, paralysed from an uncaring surgeon’s botch up job, acchan still practiced courtesy when he heard me angrily ticking off the doctor for causing grievous injury to my father. He was weak by then and but I still remember him folding his hands and whispering to the doctor : “I’m sorry for the way she spoke to you just now.” He turned to me then and said: “Never question a person who is going about doing his job. Don’t forget to be polite.” At just short of fifty years of age, I was gently nudged into relooking the way I interacted with the world. Being grateful for our lot in life and sharing our resources, no matter how scarce they were. For his children, compassion and kindness were not just words in the textbook. Our childhood home was open house for people from every background , caste, creed and religion. Acchan was a humanist and a lover of people who was much loved in return. I remember clearly the knock on the door first thing on Id and it would be Bashir uncle and his other friends, their arms loaded with Kebabs, Biryani and Kheer Korma. For them, Id was complete without their beloved bhaijaan and ditto for acchan who would wait with much anticipation for our visit to their household. It was the same for Christmas, Pateti and every other festival. The villages around Dombivili , where we grew up, was the stronghold of the agri community, proud, self-respecting people who are often labelled as a violent community who do not abide by the law of the land. Many of the people from this community worked as casual labor in the railways and were exploited, largely because they were illiterate and did not know how to stand up for their rights. For years he walked along the tracks of suburban Mumbai, in the villages where these workers lived and talked to them to understand their plight, sitting alongside the railway tracks to partake of their lunch. He became their protector, the man who organised them into a formidable force to launch a movement for their rights that resulted in the administration bowing down and regularising their employment. In return, they gave him endless love and undying loyalty. When the government pressed the massive might of the police to nab the organisers of the railway strike of 1974- acchan was one of the key leaders of that movement- he went underground, leaving amma to take care of her four children, the youngest of who was just 6 months old. The ladies from the agri community came to our home bearing the freshest produce from their fields-rice, lentils, vegetables and homemade bhakris and chuntney so amma could feed us. Amma, too proud to accept charity, would refuse to accept their offering and the women would say achhan was their father, brother and protector. He was a simple man who lived by his principles and believed in the power of learning and education. He believed a good book had the power to change and transform a human being . Just before his 80th birthday, four years ago, acchan and I had a rare chat session when he opened up and talked about the time he disappeared from our lives. He had headed to Byculla where his muslim friends lived in small apartments in the crowded lanes and by-lanes and they had taken him in, given him shelter and looked after him like his own family would, he said. They had given him a watchman’s uniform and a bus conductors uniform too so that he could go about the city in disguise, arriving in railway colonies without being nabbed by the railway police who were on the look- out for him. The Russian classics were his favourite and so were Tom Sawyer, Huckleberry Finn, Les Miserables, To Kill A Mockingbird and the PG Wodehouse series. Inclusion, therefore, was a way of life that we imbibed from being around him. Our family has experienced the magical healing powers of inclusion in our lives. He was a simple man who lived by his principles and believed in the power of learning and education. He believed a good book had the power to change and transform a human being .What he could not give us in material comforts he gave us in the form of a house full of books. The Russian classics were his favourite and so were Tom Sawyer, Huckleberry Finn, Les Miserables, To Kill A Mockingbird and the PG Wodehouse series. A great love for reading was his gift to us. We spent our entire childhood and adolescence lost in the world of books and to this day, a good book is the cure for every ill in my life. Acchan did not ever lecture or preach good behaviour to his children and I am convinced it was largely because of his hands-off parenting that we became independent and confident people very early in life. At 19, when I said I wanted to leave home and go to another city to study journalism, it put pressure on our very modest family budget but he was delighted I would be a writer. He was my in-house critic and it was the happiest moment of my life when one day, he expressed the hope that I would use my writing to improve the lot of the working class in India. Acchan did not ever lecture or preach good behaviour to his children and I am convinced it was largely because of his hands-off parenting that we became independent and confident people very early in life. He never bound us down with his expectations or emotional needs. He believed in personal freedom and that each of us should be responsible for our actions and ready to face the consequences of those actions. It broke his heart when my marriage to my college sweetheart ended in divorce but not once did he try to change my mind or talk me out of my decision. “I hope you are sure of what you are doing,” was the only sentence that he exchanged with me the day I told my parents of our joint decision. To the end of his life he adored my ex-husband and accorded him the same status and affection he enjoyed while we were married. He believed that family was made of the people with who you built relationships based on love. Sometime in the months before he passed away, I remember pouring out my despair about my 23-year-old who studied to be a pastry chef but seemed not in a hurry to start off on a career. I was afraid she was losing focus and getting comfortable with being looked after, I told him. Acchan was right. And even though it was the hardest thing to cut off her pocket money, I did it, telling her that since she already had a job, she should manage her finances accordingly. I also stopped chasing her with constant questions about her future. That in itself dramatically improved my equation with her. Months after her beloved grandfather passed away, my daughter started work on setting up her own patisserie, in collaboration with a like-minded friend and is now well on course, to a cherished career in pastry. Sudha Menon is the author of four non-fiction books including Devi, Diva or She-Devil and Legacy. She is also a former journalist and the founder of Writing With Women, a workshop series aimed at getting women from diverse backgrounds together to share their experiences through writing.